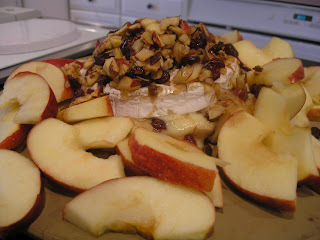 The Gantley clan recently had a family function where my sister-in-law Janet made this delicious appetizer. She has several really delicious appetizers that she serves at most of our functions. She has made this on several occasions and it always seems to wow her guests. It is one of those dishes that is so simple, yet looks so elegant. Janet, like me believes in sharing her recipes. I don’t think we have any secret family recipes. So, if it is a football game, or a bridal shower, I do hope you will try this. Preheat oven to 350°F. Coarsely chop apple. Combine apple, almonds, cranberries, brown sugar and cinnamon in a small bowl; mix gently. Stir in butter just until ingredients are moistened. Cut Brie in half horizontally. Place one half of Brie, rind side down, on cookie sheet or a round baking stone . Spoon half of the apple mixture onto bottom half of Brie, spreading evenly. 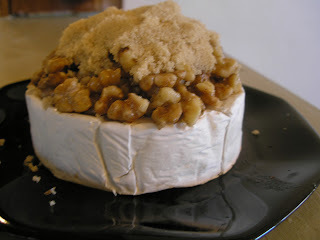 Top with remaining half of Brie, rind side up. Spoon remaining apple mixture over top. Bake 12-15 minutes or until cheese is soft and just begins to melt. Serve with apple wedges or assorted crackers.